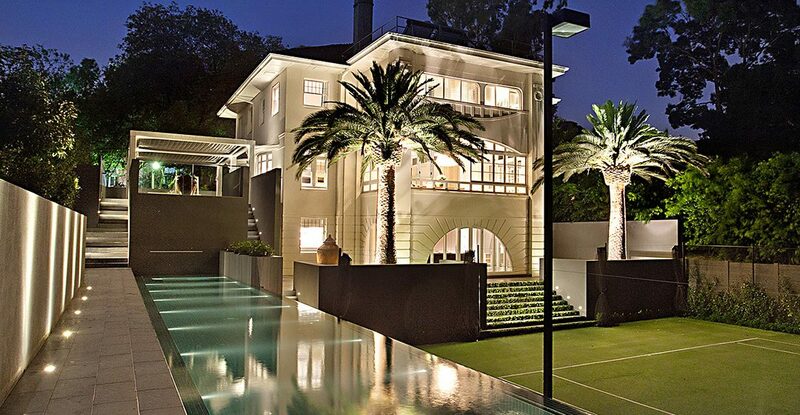 Ultracourts and Exotic Pools was hired to construct a tennis court and pool at this Art Deco-style mansion located in the heart of Toorak. 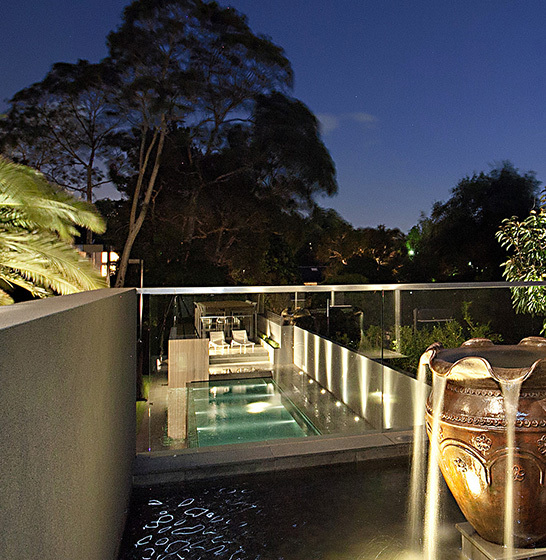 The homeowners wanted their fully renovated home to include a 20-metre infinity-edge pool with a 15-metre waterfall adjacent to the tennis court. The finished outdoor space features a range of multi-functional recreational facilities you would normally see at a country club. Incorporating stylish finishes, the best quality products and exceptional craftsmanship, Ultracourts and Exotic Pools has transformed this residential property into an enviable retreat. The pool was elevated to maximise its views of the adjacent tennis court and to ensure it was accessible from the home and its various outdoor terraces. A sundeck was also built at the far end of the pool, with a kitchenette and equipment room underneath. The inclusion of a 95,000 litre water tank beneath the pool means the garden can be watered and the pool refilled automatically. When combined with a Remco safety cover and a combination of solar and gas heating, the pool conserves both water and energy. A decorative feature wall was constructed to carry the weight of a pond and masonry garden box, which has enhanced the overall aesthetic of the outdoor area, while the pool’s spill-over trough ensures the bluestone walkway remains dry. Despite being faced with a range of engineering challenges, Ultracourts and Exotic Pools successfully managed to bring the homeowners’ design goals to life. Ultracourts and Exotic Pools constructs individually-designed, high-quality indoor and outdoor in-ground concrete swimming pools, spas and tennis courts. As well as working to its own designs, the team can liaise with architects to build courts, pools and spas from existing plans. Committed to providing the highest standard of workmanship, all Ultracourts and Exotic Pools’ projects are backed by warranties and after-sales service. The team’s aim is to design and construct tennis courts and pools that are high-quality in both appearance and function, yet in keeping with its mantra of affordable elegance. 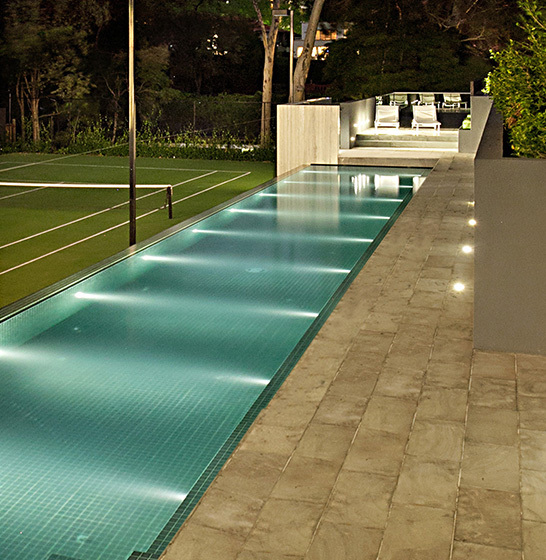 Ultracourts and Exotic Pools is a registered builder and member of both the Master Builders Association of Victoria (MBAV) and the Swimming Pool and Spa Association (SPASA).